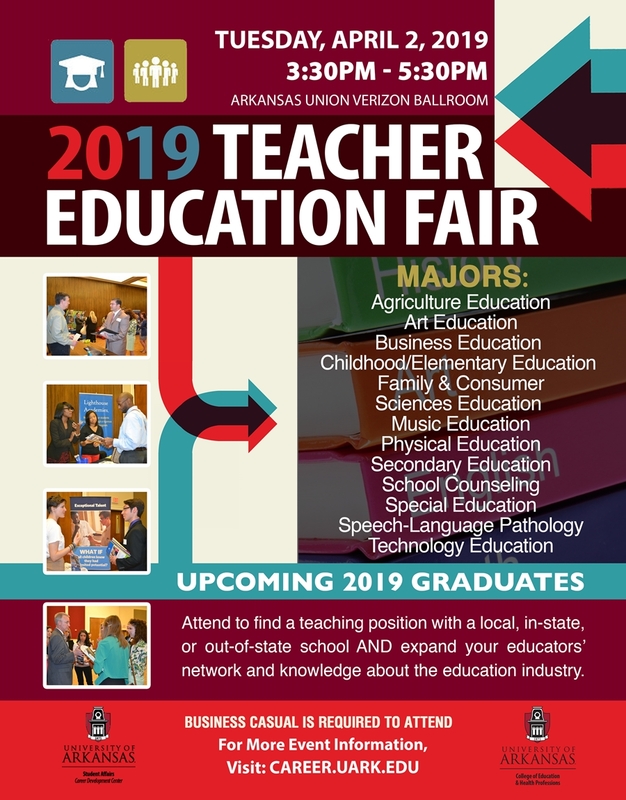 On April 2, from 3:30-5:30 p.m., the University Career Development Center, in collaboration with the College of Education and Health Professions, will host the Teacher Education Career Fair in the Arkansas Union Ballroom. This fair is for all students seeking employment opportunities within the education industry. Upcoming 2019 Graduates, if you are seeking a teaching position with a local, in-state, or out-of-state school, you will find great opportunities at this fair to connect with prospective employers seeking students with your majors. Some organizations will also be seeking recent graduates for non-traditional education positions. Also attend this fair to expand your network, polish your interview skills, learn industry information, and gather information about companies. Business casual attire is required to attend. Prepare for this fair and find a list of companies that have registered to attend by visiting https://goo.gl/Za17XY.